Twenty-two attorneys lined the benches during the hearing. CANTON — Lawyers and journalists from around the country packed a probate courtroom here for a much-awaited showdown Tuesday between Viacom Inc.’s CEO and his boss, Sumner Redstone. But the first thing on the judge’s mind was not the fate of Redstone’s $40 billion media empire. It was something perhaps far more important than a bunch of rich people squabbling: the glaring lack of female attorneys in court. At the start of the hearing, there were so many suits that Probate and Family Court Judge George Phelan asked for all lawyers involved in the case to line up in front of his courtroom for a roll call. The headcount: 22. Only two were women. He was not happy. No, it’s about time someone said something. In that moment, Phelan put front and center an issue that has dogged the legal profession for decades. Even with women making up just under half of all law school graduates, a gaping gender gap persists. Perhaps it’s the long hours, the male-dominated culture, or outright discrimination, but women drop out and account for only about 36 percent of the profession, according to the American Bar Association. Of those who practice, only about 18 percent of women are equity partners at the country’s largest firms, and they earn only 80 percent of the typical male equity partner, according to survey done by the National Association of Women Lawyers. The stakes in the Redstone case are big. Philippe Dauman, the chairman and chief executive of entertainment juggernaut Viacom, is fighting for survival. On May 20, Redstone abruptly removed Dauman and longtime friend and Boston lawyer George Abrams from the trust that will oversee the mogul’s estate after his death or he becomes incapacitated. The men were also ousted from the board of National Amusements Inc., a Norwood theater chain that controls 80 percent of the voting stock in Viacom and CBS Corp.
Days later, Dauman and Abrams filed suit in the Norfolk probate court alleging that Redstone’s daughter, Shari, is manipulating her frail 93-year-old father so she can gain control of the family fortune. Shari Redstone, who is president of National Amusements and vice chair of CBS and Viacom, denies the allegations. Change can happen from the bench. Some federal judges make recommendations about their courtrooms, such as asking for more junior lawyers to participate in court proceedings. Such a policy would in effect give women more opportunities to litigate. Often, female attorneys are part of big litigation teams, but they don’t get speaking parts and instead are relegated to roles behind the scenes. That was the case on Tuesday. Beyond the roll call, only male attorneys spoke. After the 2½-hour hearing, many would not comment about the case but acknowledged the profession’s gender problem. “It is a disparity the judge has appropriately noted,” said Rob Klieger, Sumner Redstone’s lead attorney. Klieger said of the roughly 15 lawyers working on Redstone’s behalf related to cases in Massachusetts and in Los Angeles, where the media titan lives, about four or five are women. Prior to his nomination by Governor Deval Patrick in 2009, Judge Phelan was a decorated Army colonel who worked for the State Department in Iraq as a rule of law adviser. He grew up in Fall River in a housing project, and after his military stint, he opened a solo practice focused on elder law. In Baghdad, Phelan established women’s centers, put Iraqi women lawyers to work in courts, and designed and implemented the first domestic violence census of Iraqi women. For this work, Phelan received the State Department’s Swanee Hunt Award from then-Secretary of State Hillary Clinton for advancing women’s rights. Hunt, who lives in Cambridge, served as the ambassador to Austria, and the award was created to recognize her service. Kim Dougherty, the past president of the Women’s Bar Association, also lauded Phelan’s remarks from the bench. Getting more women to play big roles in courtrooms increases their chances for advancement, better pay, and opportunities to seek judgeships, which require lead trial experience. 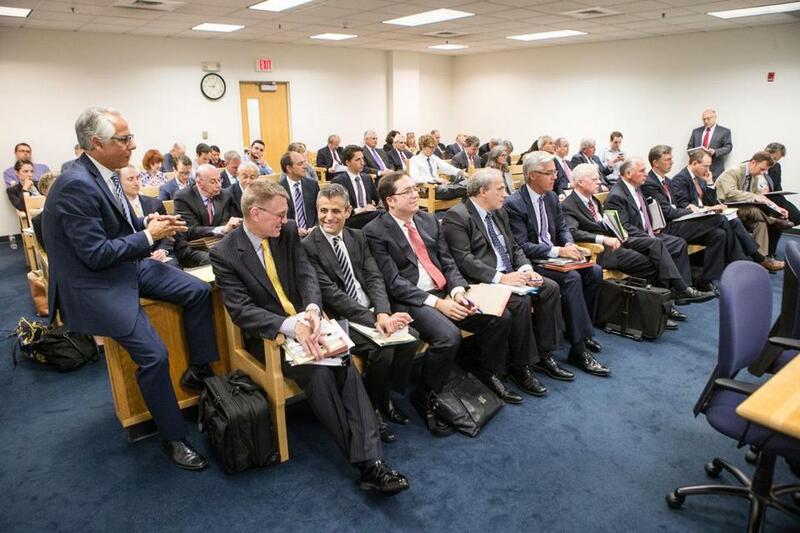 About 40 percent of Massachusetts trial court judges are women. Gertner — the retired judge — herself was known to make observations about gender diversity from the bench. She makes one more about the next hearing in the Dauman v. Redstone case.